The Best Virtual Reality blogs from thousands of top Virtual Reality blogs in our index using search and social metrics. Data will be refreshed once a week. Also check out Top Virtual Reality Youtube Channels list for Top videos on Virtual Reality. Virtual Reality newsletter is a comprehensive summary of the day's most important blog posts and news articles from the best Virtual Reality websites on the web, and delivered to your email inbox each morning. To subscribe, simply provide us with your email address. About Blog Road to VR is the world's leading independent news publication dedicated to the consumer virtual reality industry. We explore the bleeding edge of virtual reality, augmented reality, and human-computer interaction. We're charting the course between today's immersive technology and that of the distant future, capable of perfect simulations of reality. Facebook fans 39,330. Twitter followers 71,228. San Francisco, CA About Blog UploadVR is dedicated to bringing virtual reality technology to the consumer masses. We believe that VR technology is fundamentally transforming the way we learn, interact and understand the world around us. Blog posts covers Virtual Reality News, Events, and Talent. Facebook fans 120,735. Twitter followers 60,128. Los Angeles, CA About Blog This blog, with its scan-able, modern interface, doesn’t only cover the best news and reviews from the world of VR but also the people and artists behind it. Find the latest news regarding VR Vive, Rift, and Cardboard and interesting podcasts and videos all in one place! Facebook fans 393,071. Twitter followers 60,177. UK About Blog VRFocus is a virtual reality specialist website covering all aspects of the technology and primarily concerned with VR entertainment. The website is more focused on bringing you news and features from VR Rift, Vive, Cardboard, and other essential VR gear than anything else. find the best guides and advice on VR Gear right at this online portal! Facebook fans 20,808. Twitter followers 47,532. Los Angeles, California, USA About Blog Get virtual reality trend news & reviews at Virtual Reality Reporter. We serve you the latest virtual reality, VR, HMD & augmented reality trend news & expert reviews. Facebook fans 79,371. Twitter followers 6,887. Amherst, Mass. About Blog Hypergrid Business posts helpful and interesting news and reviews on VR as well as AR, VR Metaverse, VR headsets, and VR QR codes for you to calibrate your phone apps to work with your particular headsets. Hypregrid Business has all the latest news collected straight from VR enthusiasts and the industry, put together in one online publication. Do check it out! Facebook fans n/a. Twitter followers 1,552. Berlin, Deutschland About Blog Haptical is a leading news and information source on Virtual Reality. We track latest breakthroughs and trends to stimulate growth in the VR industry for a global audience. Virtual reality is a complex technology…We make it easy, understandable and accessible through engaging stories, best practices and reviews. Facebook fans 1,026. Twitter followers 46,174. Facebook fans 11,887. Twitter followers 12,373. About Blog Virtual Reality Pop is packed with news, analysis, and techniques about virtual reality, augmented reality, Oculus Rift, HTC Vive, gear VR, steam, PSVR, daydream, 360 video and more. Facebook fans 872. Twitter followers 2,030. About Blog The Virtual Reality Summit represents the "best of the best" in virtual reality and augmented reality innovation. The conference program brings together leaders in technology who leverage the virtual experiences provided by VR and AR platforms to build scalable business models and enhance creative opportunities in entertainment, marketing & advertising, media, education, healthcare, and more. Facebook fans 1,319. Twitter followers 358. About Blog Google News feed for virtual reality. Facebook fans 25,543,786. Twitter followers 214,618. About Blog A common ground for discussion relating to Virtual Reality and Virtual Worlds. Facebook fans 1,178,321. Twitter followers 537,128. San Francisco About Blog With Leap Motion, you can interact with digital content in virtual and augmented reality, Mac and PC using your hands just as you would in the real world. Our unique combination of software and hardware tracks the movement of hands and fingers with very low latency, converting in into 3D input. Our mission is to remove the barriers between people and technology. Facebook fans 85,164. Twitter followers 41,897. About Blog How to make vr apps? InstaVR is a web service that allows you to create your VR app with a few clicks. You can create your own VR movie player, VR tourism guide. Facebook fans 8,262. Twitter followers 10,752. Irvine, CA Global HQ About Blog EON Reality is the world leader in Virtual and Augmented Reality based knowledge transfer for industry and education. We believe that knowledge is a Human Right, and it's our goal to make knowledge available, affordable, and accessible for every human on the planet. To do this, we're creating the next generation of Virtual and Augmented Reality tools to increase the world's knowledge transfer capabilities. Facebook fans 70,246. Twitter followers 6,056. California About Blog WITHIN is the premier destination for innovative, entertaining, and informative story-based virtual and augmented reality. We bring together the best immersive experiences from the world's finest VR creators—from gripping tales set in worlds of pure imagination to documentaries taking you further inside the news than ever before. San Francisco, CA, US About Blog Tech Trends showcase for the latest disruptive technology that is changing the education landscape globally. Blog post covers virtual reality. Facebook fans 328,794. Twitter followers 2,331,228. New York About Blog The Verge was founded in 2011 in partnership with Vox Media, and covers the intersection of technology, science, art, and culture. Blog post covers Virtual reality. The Verge's mission is to offer breaking news coverage and in-depth reporting, product information, and community content via a unified, modern platform. Facebook fans 3,488,498. Twitter followers 2,400,215. About Blog Blog post covers virtual reality and reviews on best VR You can get with. Facebook fans 1,582,113. Twitter followers 2,888,652. San Francisco, CA About Blog A blog maintained and updated by the CEO of Sensics and the co-founder of OSVR himself! This blog provides in-depth insights on the technical and mechanical aspects of VR.Learn from the VR expert himself! Stay updated with The VRguy’s Blog and learn a great deal about VR tech and news. Facebook fans 2,829,750. Twitter followers 10,057,608. Portland, OR, and New York, NY About Blog Covering the hottest news on all digital trends, VR news is one of the more beaming topics on this website than others. They report news and trends from the VR industry from a different perspective and with greater insights. Facebook fans 1,801,389. Twitter followers 2,074,032. Santa Clara, CA About Blog The leading technology company from the world of Artificial Intelligence, Nvidia has dedicated a good amount of content on their blog to VR and AR. This is a reliable source for all the latest news, reviews, and tip-offs from the VR world. Facebook fans 2,237,318. Twitter followers 1,413,955. About Blog Mashable, the global platform for the most intriguing news on tech, science, and much more, discusses the latest and most interesting stories on Virtual Reality on their website. As always, they live up to their standards and provide nothing but the most entertaining news on VR. Facebook fans 7,369,671. Twitter followers 9,807,254. NYC | Orange County, CA About Blog The latest news, videos, and discussion topics on Virtual Reality. Facebook fans 3,445,316. Twitter followers 3,332,424. About Blog Reviewers of computer hardware and pretty much all the latest tech, Anand Tech has all the latest news and reviews regarding VR headsets, their applications, and their producers. Join the community of tech geeks and stay updated VR and lots more. Facebook fans 53,192. Twitter followers 65,257. San Francisco About Blog Curators and informers of the best and the brightest digital lifestyles, Slash Gear has all the latest promotional and informational content on VR products and their guides and reviews. Facebook fans 105,776. Twitter followers 46,173. United States About Blog VeeR was born out of the belief that content sharing is veering towards VR. As VR creation and consumption is becoming more accessible to everyday users, VeeR’s vision is to be the natural platform for everyone to express their creativity, promote their works, and engage in community. While we believe that VR is the future of storytelling, we also believe that you are the future of VR. Facebook fans 23,701. Twitter followers 18,570. Idaho, USA About Blog VR Fitness Insider is focused on the ways that VR and AR can be used to improve overall health, fitness, body composition, strength, endurance, motor skills, mental health, aesthetics, sport-specific skills, agility, injuries, fitness motivation, and general health knowledge. Facebook fans 2,898. Twitter followers 1,389. San Francisco, CA About Blog Find the best vr games and best vr headsets all in one place. Read our virtual reality gaming news and get the latest in vr gaming trends and hot new vr gam releases. England, United Kingdom About Blog VR Reviewz covers headset reviews, VR software, VR apps, free videos, buying guides, game reviews and all the latest news for all Virtual Reality devices. Facebook fans 54. Twitter followers 2,459. Germany About Blog VirtualR.net is the leading news resource for the sim racing community, offering news, downloads and in-depth reviews on anything that’s of interest for fans of virtual racing. Facebook fans 9,231. Twitter followers 8,498. Irvine, CA Headquarters About Blog EON Reality is the world leader in Augmented Reality & Virtual Reality Software and Development for industry, education, and edutainment. Facebook fans 70,648. Twitter followers 5,937. About Blog This blog covers almost everything about tech startups and VR; news, reviews, and previews. VR news and information posted in layman terms, The Ghost Howls takes in consideration everyone even remotely interested in VR and report accordingly. Facebook fans n/a. Twitter followers 5,684. Dundee, Scotland About Blog Pocket Sized Hands is an award-winning AR/VR developer focusing on creating original content and building bespoke software solutions. Facebook fans 149. Twitter followers 611. London About Blog Creators of VR experiences for marketing, entertainment, and arts, they use technologies like Oculus Rift, Gear VR, Google Cardboard, etc. Their proactive blog features all sorts of news and latest happenings around the VR world and guides on how to improve your VR production skills. Facebook fans 208. Twitter followers 1,390. USA About Blog OVRnews is the Unofficial Blog of the Rift. An independent, VR News source dedicated to covering the latest topics on the Oculus Rift virtual reality headset, VR gaming, reviews, videos and more. Our goal is to be your trusted source for all things Oculus & Rift Gaming applications throughout this VR revolution & beyond! Facebook fans 1,027. Twitter followers 6,341. Los Angeles, CA About Blog Reviews of Games for the Oculus Rift Virtual Reality Headset. Facebook fans 17. Twitter followers 151. Toronto, Ontario About Blog VR Vision is a Virtual Reality company that provides full turnkey solutions for business. We provide application development, hardware deployments, SaaS products and all things virtual reality. Contact us today to see how VR can shape your business. Facebook fans 2,849. Twitter followers 847. About Blog VRRealLife.com is offering a new online directory for virtual reality videos and information on VR. It serves as a rich platform and gathering place for enthusiasts, businesses, video producers and more. Facebook fans 781. Twitter followers 280. Brooklyn, NY About Blog EEVO is a premium white label service for distributing immersive VR content across custom branded applications on all devices and platforms. Facebook fans 6,516. Twitter followers 637. About Blog Strong believers that VR is the new and upcoming lifestyle of the world, VR Life reports news and reviews on VR systems and platforms. They provide pragmatic VR guides and solutions to the whole community. VR Life is working on finding an intersection between VR and the daily life. Join in and make your contribution to the revolution! Facebook fans 80. Twitter followers 284. About Blog The goal of this blog is to show people what they need to know to get the best out of virtual worlds and to suggest lines of creative thinking on how to exploit the potential of virtual worlds. Bengaluru, India About Blog Affinity VR is a platform for conversation about the latest news, trends, gadget reviews, & ideas pertaining to the Virtual Reality & related domain. Facebook fans 401. Twitter followers 176. Israel About Blog Welcome to I Cyber Bate, your number one source for all the VR products and content out there. ICyberBate is dedicated to giving you the very best of VR products, with a focus on VR Adult toys, Unique VR products , Unique VR content. St. Toronto, ON About Blog Blog about Virtual Reality in a different perspective. Here you will find everything about Virtual Reality Experiences! Facebook fans 494. Twitter followers 233. Murcia, Spain About Blog Superlumen is covering Virtual Reality and its application in the world of games and movies, and doing so exceedingly well. Keeping their audiences entertained and top of the VR game, they are natural favorite of the VR community all over the world. Facebook fans 684. Twitter followers 1,490. World About Blog TECHPRIOR is a rapidly growing technology magazine and online news covering future technologies including AR, VR, MR, Machine Learning and IoT. Facebook fans 176. Twitter followers 165. Seattle | SF | Shanghai About Blog Studio 216 is a digital Production Agency helping clients experience the unbuilt environment. Using virtual reality, visualization and mobile application to craft the story of place. Facebook fans 339. Twitter followers 821. About Blog HTC Vive Games, VR Games. We feature reviews, lets play videos, news, gameplay videos, top vive games, top vr games, steam cd keys. London About Blog A rather fun and focused blog on latest VR news and storytelling! A rather fun and focused blog on latest VR news and storytelling! A rather fun and focused blog on latest VR news and storytelling! Facebook fans 478. Twitter followers 1,221. About Blog A blog on Tumblr about virtual reality. Facebook fans n/a. Twitter followers 3,657. About Blog VRWatchman Launched in 2016, VRWatchman is the world’s trusted independent news publication designed for the user virtual reality sector. We discover the best news of virtual reality, augmented reality, and human-computer relationship. Facebook fans 11,181. Twitter followers 371. San Jose, CA About Blog The one-stop for industry news and technology updates on VR and AR, Super Reality also posts video demonstrations of all the technology and latest releases they can get their hands on. Super Reality is sure to keep you in the loop of all that’s up with the VR world. Facebook fans n/a. Twitter followers 5,112. South West, England About Blog virtualrealityevo Examine commercial use cases in VR, discuss how businesses can incorporate VR into their strategy to increase value and deliver insight on the future of VR. Columbia, MD About Blog Yuval Boger (VRGuy), CEO of Sensics, and co-founder of OSVR shares his experience and views on HMDs and VR technologies. About Blog Virtual Reality For Humans. South East, England About Blog The Digital Marketing Bureau focuses on a highly analytical approach to Social Media providing you with instant results and a transparent overview. All of our content discussing Virtual Reality, from the latest innovations to events, industry movements, opinion and more. Facebook fans 442. Twitter followers 714. United States About Blog VRstatus is a special VR community, which is directed to VR games, VR apps and 360 vidoes. We provide VR platform which serves for you as a strong tool to manage and enjoy Virtual Reality. Facebook fans 2,894. Twitter followers 1,789. About Blog Reality Dome is dedicated community for Virtual Reality, Augmented Reality and Mixed Reality enthusiast; Here you can find the latest news, review, and games about VR, AR, and MR.
Facebook fans 4,051. Twitter followers 441.
virtually anywhere About Blog Google VR is on a mission to bring amazing virtual reality experiences to the world. Discover all the latest about our products, technology, and Google culture on our official blog. Facebook fans n/a. Twitter followers 109,584. Israel About Blog AppReal-VR is a software development company that has the vision to create dynamic Virtual Reality and Augmented Reality ventures. It has years of experience in various fields such as Gaming, Mobile Application Development, Augmented Reality and Virtual Reality. Facebook fans 340. Twitter followers 3,625. About Blog VRBites is the best place for all virtual reality enthusiastic. This is a comprehensive blog providing news on VR players, hardware, games, and apps. Together with news, they help the VR community with honest reviews and how-to articles on the latest VR tech. Facebook fans 369. Twitter followers 431. About Blog Together with news on VR products, this blog broadcasts and covers the most happening VR festivals taking place. don’t miss out on VR festivals happening nearby or the news from the industry. About Blog Delight VR - Virtual Reality for the Web. The player for showcasing immersive VR content on your website. Showcase 360 movies, panoramic images, interactive walkthroughs, 3D images and scenes. Stream content to all HMDs on Mobile, Tablet, Desktop. Facebook fans 290. Twitter followers 113. Davis, CA About Blog Doc-Ok is a blog on VR and 3D computer graphics, reporting news and reviews from a developer’s perspective; all of this written in the most immersive, engaging manner along with videos and pictures. Seeing things from a developer’s perspective, you are guaranteed to learn more and in-depth about VR and 3D computer graphics. Facebook fans 56. Twitter followers 1,379. San Mateo, CA About Blog Unimersiv is working on bringing VR to the education scenario.They post reviews and blogs along the premises of this wishful aim and all the latest news from the VR world. become part of the Unimersiv project and add more value to our educational systems with VR. Facebook fans 1,360. Twitter followers 3,144. Silicon Valley / San Francisco About Blog Another website dedicated to helping students in all fields of study learn better with VR! The Z Space blog features all the latest news and happenings regarding VR from an educational point of view. Z Space is on a great mission and leading the way forward by finding a common point between VR and our education systems. Facebook fans 7,868. Twitter followers 10,352. 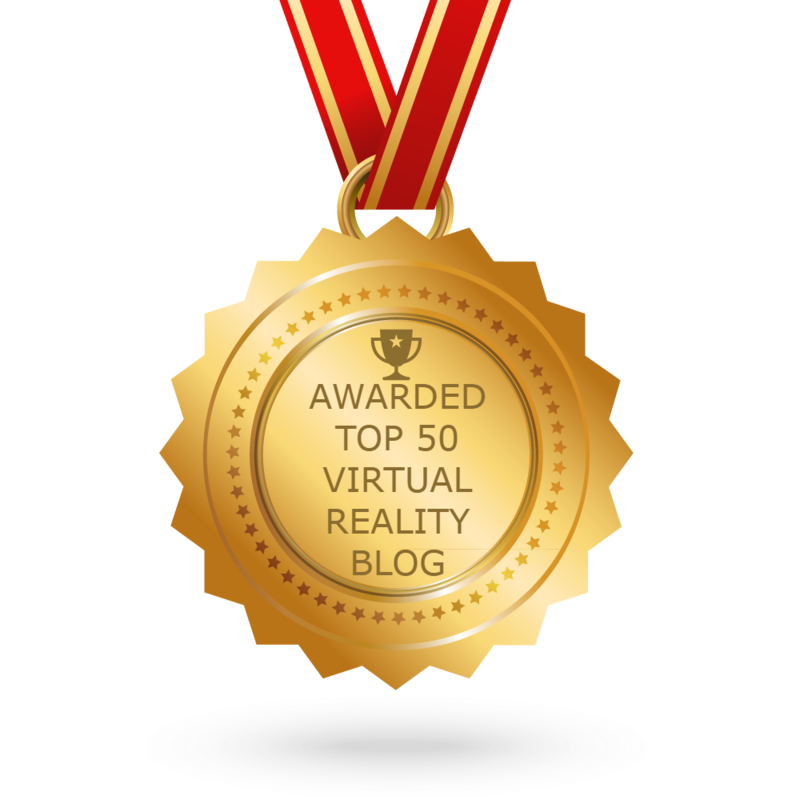 CONGRATULATIONS to every blogger that has made this Top Virtual Reality blogs list! This is the most comprehensive list of best Virtual Reality blogs on the internet and I’m honoured to have you as part of this! I personally give you a high-five and want to thank you for your contribution to this world.